HIGH QUALITY CARBON FIBER WEAVE PATTERN WATCH CASE WITH CLEAR GLASS TOP LID--sporty, durable, smooth and beautiful. SILVER METAL BRUSHED LOCK--to keep the watch/jewelry collection secure. SOFT TOUCH LEATHERETTE LINES THE INTERIOR--the soft interior will help to protect your watches and jewelry from scratches. 10 INDIVIDUALLY DIVIDED SECTIONS--for 10 watches or jewelry. 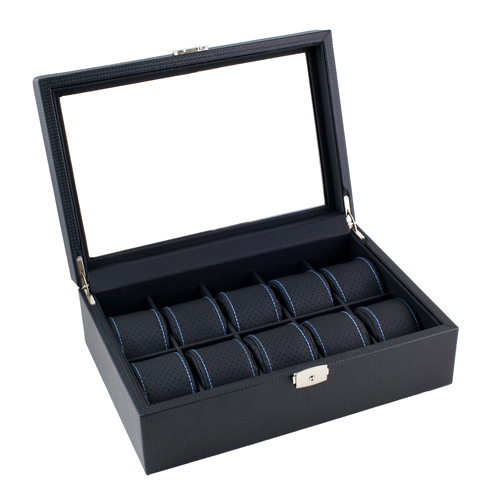 EACH DIVIDER WILL HOLD A WATCH WITH CASE (INCLUDING CROWN) UP TO 53mm.